A rather different beast to many of the bands we cover here at Heavy Planet, but one none-the-less that falls directly into our musical category. Solo musician Goryl offers us a chance to explore the far reaches of our darkest souls with his heavy ambient drone project, and having recently released an acoustic take on his work, it’s about time that we divulged these dark lonely winter nights shadowing his drawn out growling riffs. His previous two EPs The Father Of Witches and The Father Of Evil Witches offer mesmerizing droned riffs that only his outpouring soul could decipher as he sits hunched over his bass-heavy guitar shredding out cursed, devastating drawn-out riffs that feel like the hand of death upon your shoulder, encompassing and frightening in alliance. 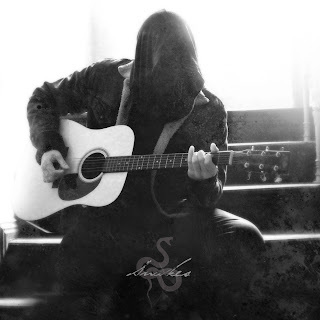 Describing his sound as “A line of poetry written with a splash of blood - a sonic reminder that you will suffer many hardships and adversities, but you will not die until the day appointed for you doom”, Goryl is not to be taken on board without fair warning. His latest release, Snakes, an acoustic EP, offers as much bleak, droning respite as his previous work, which is an impressive feat. The final track on the EP 'Lovely Witches' even offers some hushed whispered vocals which is a welcome respite from his otherwise instrumental music. Goryl’s musical work so far is utterly transfixing, from each lonely desolate pluck of the guitar string to the next downturned soul wrenching note, you find yourself totally overcome with a sense of being, it’s not a sound which uplifts or necessarily makes you think, but rather a sound which keeps you static, aware of the darkness and decay around you, embracing death as much as life itself. Goryl is heavy, other-worldly, and vital.